Morocco virtually annexed the northern two-thirds of Western Sahara (formerly Spanish Sahara) in 1976, and claimed the rest of the territory in 1979, following Mauritania's withdrawal. A guerrilla war with the Polisario Front contesting Rabat's sovereignty ended in a 1991 UN-brokered cease-fire; a UN-organized referendum on the territory's final status has been repeatedly postponed. In April 2007, Morocco presented an autonomy plan for the territory to the UN, which the U.S. considers serious and credible. The Polisario also presented a plan to the UN in 2007 that called for independence. 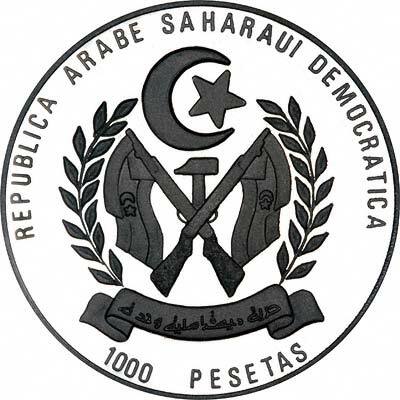 Representatives from the Government of Morocco and the Polisario Front have met four times since June 2007 to negotiate the status of Western Sahara, but talks have stalled since the UN envoy to the territory stated in April 2008 that independence is unrealistic. For silver and base metal coins of Western Sahara, please look at our original Chard Coins website. We make an active market in almost all world coins, gold or otherwise, including Western Sahara gold coins. If you have any of these coins to sell, please contact us, or post them to us for appraisal and offer.